The Healthcare Whistleblower's Protection Act is a whistleblower law poster by the Vermont Department Of Labor. This poster is mandatory for some employers, including employers who fall under the healthcare sector. This poster must be posted in a conspicuous place by all healthcare employers so that all employees can easily see it. This poster describes the protections that whistleblowers in the healthcare industry get, when employees are eligible for these protections, and when it is possible to bring action against employers for violating this law. It appears you don't have a PDF plugin for this browser. 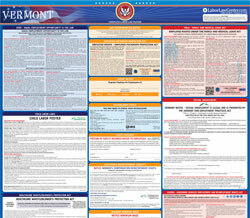 Please see the link below to download vermont-wh-whistle-blower-healthcare.pdf. Auxiliary aides and services are available upon request for individuals with disabilities. Interpretive services are also available for persons with limited English proﬁ ciency. This poster may be copied.